My Book: A Well-Crafted Home! I’m so excited that today my book, A Well-Crafted Home: Inspiration and 60 Projects for Personalizing Your Space, officially launches! All 224 pages are packed with beautiful images and tons of inspiration - and did I mention, SIXTY projects! When my husband and I moved to New York ten years ago, we had a minimal budget to furnish our apartment. Seeking a way to add unique touches to our space that would stand the test of time, I turned to DIY projects that were well-designed, practical, and made with good-quality materials. A Well-Crafted Home is an inspirational jumping-off point for anyone looking to build an environment that feels special and authentic. Equal parts inspiration and DIY guide the book starts with a primer that takes you through the new rules of design, how to get started, and how to stock the perfect DIY toolkit. We then dive into the home and go room by room, starting with the entryway, and talk about how to make each space uniquely yours. We complete the book with a vast section of techniques and skills that you can apply to a host of other projects as well as the ones featured in the book: Natural dyeing, how to cut wood, working with leather, antiquing mirrors, and more! I believe in making things you love. Making things of quality that you want to keep for many years to come and even pass them down to future generations. I want you to love the space you're in and feel empowered to transform it with your own two hands. This book has been such a joy to write and a true labor of love. Thank you to those who pre-ordered the book, are stocking it in your shop, and those who have been championing me through the process. I am so grateful! A huge thank you to my publisher Clarkson Potter, my editor Angelin Borsics who made me sound like a pro, Julia Wade who took all the gorgeous photographs for the book, Tate Obayashi who drew the sweetest illustrations, and to all the homeowners who let me use your spaces; Joseph and Rachel Bradley, Lisa and Justin Hauenstein, Steven Burke and Randy Campbell. It takes a serious team to write and publish a book - please make sure to check out the acknowledgements page because I got to work with some really awesome people and I couldn't have done it without any of them! And lastly, I would LOVE to see your copies out in the world, in your hands, and in use - please share and tag #AWellCraftedHome. My hope is that you come back to the book time and time again. It's been a long time in the making but I am utterly thrilled to share a brand new resource with you today. 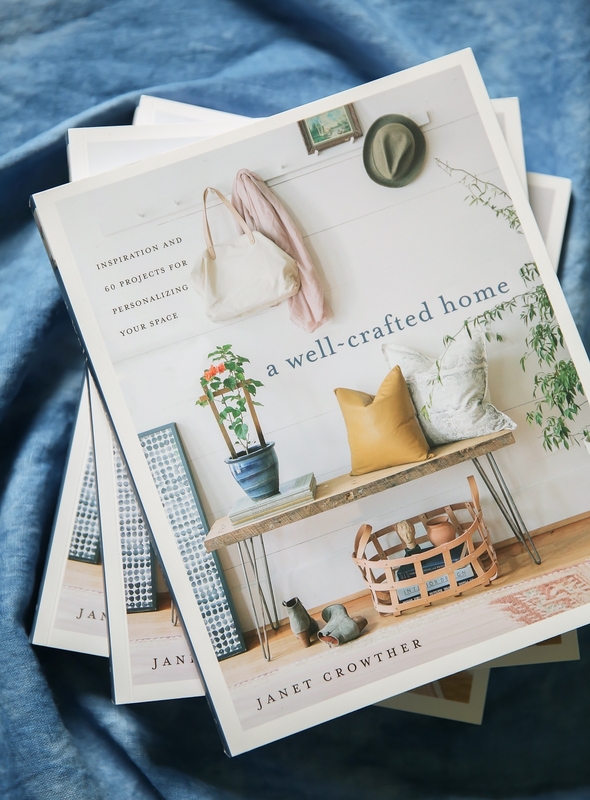 My latest book, AWell-Crafted Home, is designed to help you unlock the potential within your home and give you the confidence to create lasting pieces in your own personal style. I can't believe its officially out in less than 2 months! I was shipped the first copies, hot off the press from my editor, and this book is truly beautiful. A dream come true for me. For now feast your eyes on just a few of the 60 projects that will be covered in the book. I tried to pick a favorite project but I can't! Just so you know, I practice what I preach - ALL of the projects in this book are currently in use at our home. The beaded light fixture below is hanging up in my daughters room. All the throw pillows have graced our sofa since we shot the final images and the hammock has been swinging in our backyard all summer. I believe in making things you love. Making things of quality that you want to keep for many years to come and even pass them down to future generations. I want you to love the space you're in and feel empowered to transform it with your own two hands. I hope you'll pick up a copy of this book and keep me in the loop on what you've made! Pre-order your copy HERE before it's released on September 26th. Thanks so much to those of you who have already ordered the book, or placed an order for your friends and family. I've been working on this project for over two years and can't wait to hear what you think.